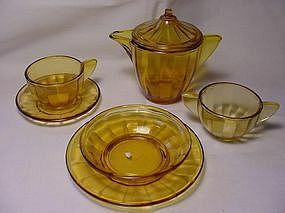 The Octagonal Children's set is the most plentiful shape Akro Agate made. 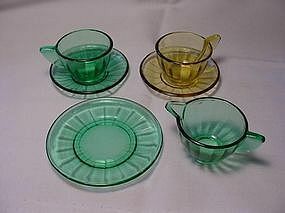 Offered here are assorted pieces from the large size set as follows: one sugar lid at $15.00 each, 2 pink saucers at $10 each, and 1 blue saucer at $16.00. 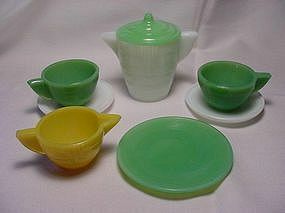 (Sorry, the creamer, teapot lid & yellow saucer are sold) All are in excellent condition. 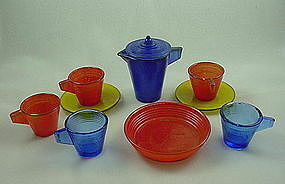 See my other listings for more Akro toy dishes. The Octagonal Children's set is the most plentiful shape Akro Agate made. 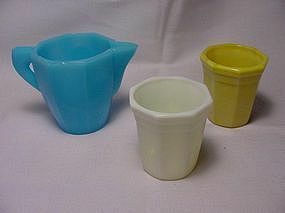 Offered here are tumblers and teapot from this line. 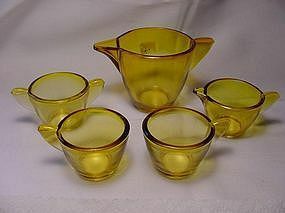 I have 4 yellow and 2 ivory tumblers for $20 each (either color). Also available is the hard to find blue teapot with open handle from the small size Octagonal set. 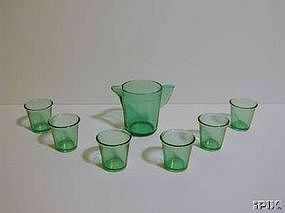 It has a small chip on the top edge that could be polished out (visible in the picture) and is priced at $35.00. 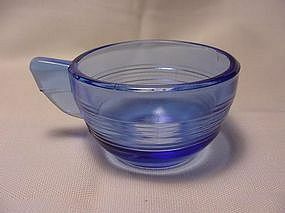 See my other listings for more Akro toy dishes. The Octagonal Children's set is the most plentiful shape Akro Agate made. 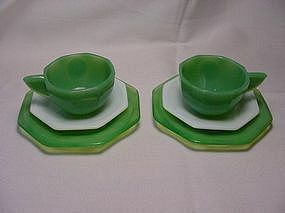 Offered here are cup & saucers and plates from the large size Octagonal set. 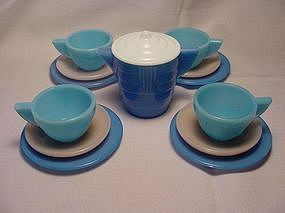 I have 2 cup & saucer sets for $22.00 each, and 4 plates at $10 each. All pieces are in excellent condition. 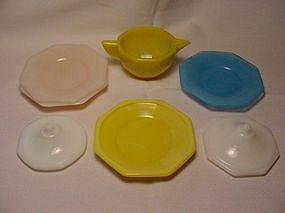 See my other listings for more Akro toy dishes. Stippled Band was the first toy dish pattern produced by Akro Agate. The transparent topaz color pictured here was only made in 1935-6 and is very difficult to find. 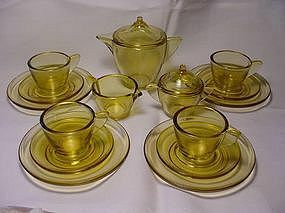 Pictured here are assorted pieces from the Small size Stippled Band set that I have available: teapot & lid $55, 3 saucers at $6 each, and 5 plates at $10 each. 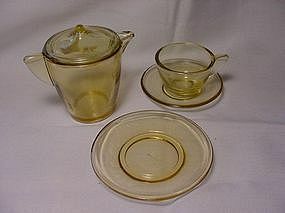 Also available, though not shown are 2 teapots with no lids for $30. 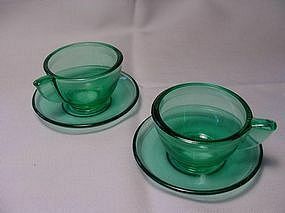 (The cup & saucer pictured is sold. )See my other listings for more Akro Agate Child sets. Stippled Band was the first toy dish pattern produced by Akro Agate. The transparent topaz color pictured here was only made in 1935-6 and is very difficult to find. 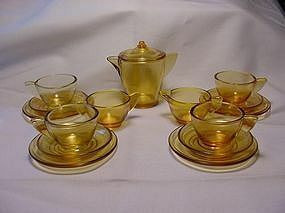 This 16 piece set is the Small size Stippled Band and includes the teapot and lid, 4 plates, 4 cups & saucers, sugar & creamer. 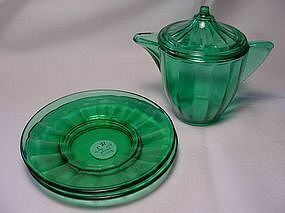 There is a flake off the underside of the teapot lid, all the rest of the pieces are in very good condition. See my other listings for more Akro Agate Child sets.